content="Mozilla/4.7 [en]C-gatewaynet (Win98; I) [Netscape]"> Coalitions with Democrats, No! Class Struggle to Shut NYC Down, Yes! CUNY Internationalist Clubs, Class Struggle Education Workers and Internationalist Group, March 24. We reprint below the CUNY Internationalist Clubs leaflet distributed at the March 24 NYC “state of emergency” protest. Ever since the bank crash and stock market panic of September 2008, working people, students, oppressed communities, the poor and large parts of the middle classes have been under attack. Unemployment quickly shot up to Depression levels and has stayed there, millions were forced out of their homes by foreclosures. While government “stimulus” spending was able to mask some of the worst effects for a time, the deficit financing has run out. Lately the rulers have conjured up a “fiscal crisis” in order to launch a frontal attack on workers’ rights. We saw it in Greece and France last year, and now we are facing it here. As signs carried by labor supporters in the recent mobilizations in Wisconsin against a vicious union-busting law said: this is class war. On top of which the U.S. has just launched yet another imperialist war in the Middle East, raining death on Libya in the name of humanitarianism. We are facing a concerted capitalist assault on working people. The criminals who caused the crisis are trying to make their victims pay for it. This affects every one of us, through tuition hikes, increasing class sizes, mounting student debt, day care cuts, skyrocketing medical insurance costs, massive job losses and mass deportations, and now a drive to eliminate collective bargaining altogether. It is a bipartisan attack, by Republicans and Democrats alike. The March 24 coalition includes Democratic Party politicians and a host of groups linked to them. In fact, the demands of the demo are geared precisely to be acceptable to liberal Dems. Like the “civil disobedience” called by leaders of the Professional Staff Congress (the CUNY faculty union) in Albany on Wednesday, the demo is essentially a more “militant” form of lobbying. It’s all part of the Great Dance that takes place every year as the budget is negotiated. Students, and millions of others, are certainly in a “state of emergency.” Tuition at the City University of New York went up 5 percent in January, and the CUNY Board of Trustees has already authorized another hike for this fall, pending approval in the state legislature. In the last two decades annual tuition (which did not exist from 1848 until 1975) has almost quadrupled, rising from $1,350 to $4,830 at CUNY four-year colleges. This raises the already formidable barriers facing working-class, black, Latino and immigrant students. The Internationalist Clubs have organized to fight this class and race purge of higher education. 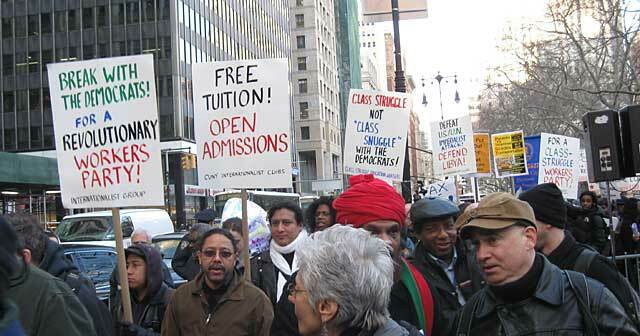 It’s no accident that tuition was introduced the year that CUNY first had a majority of non-white students, the result of the 1969 City College occupation that opened the doors to all NYC high-school graduates. We oppose all tuition hikes and call for free tuition and open admissions, as well as for a living stipend so that college education could truly be available to all. We also call for the abolition of the Board of Trustees and instead for student-teacher-workers control of CUNY. The March 24 coalition puts forward a laundry list of demands, including: jobs not layoffs; affordable housing; no cuts to social services; no union-busting or privatization; stop school closings, etc. But how does it propose to achieve these goals? It has a three-point program: extend the millionaire’s tax, close corporate tax loopholes and bring back the stock transfer tax. In short, their slogan is “Tax the rich.” Taxing the wealthy is fine by us, but it won’t put a dent in the assault on public education and working people. For starters, New York State already has the fabled “millionaire’s tax” on the books. It was voted by the Democratic state legislature in 2009. But that hasn’t stopped the capitalist rulers from crying wolf about the supposed “fiscal crisis” (see box, right). Moreover, New York State already had a stock transfer tax from 1916 to 1981. These demands are not the least bit radical, having been voted by the perennial Democratic majority in the NY State Assembly. In an article titled “Outraged New Yorkers Unite March 24” in the Amsterdam News (17 March), Ramon Jimenez writes that “The growing coalition realizes that we need revenue-generating proposals to avoid these cuts.” (Jimenez ran for NY attorney general, the state’s chief prosecutor, on the Freedom Party ticket in last year’s election.) Well, actually, not. Fiscal crisis or no, it is not up to the working class to tell the capitalist government how to raise more money. Even if they had more bucks, they wouldn’t use it to meet our needs. The March 24 coalition began as a lash-up of several left groups, notably the International Socialist Organization and Workers World Party, plus their various offshoots and CUNY Mobilization Network, an umbrella group of campus reformists. Enlisting a number of education and community groups and several unions, they throw in a couple of minor capitalist “third parties” (the Green Party and Freedom Party) for respectability, and – presto! – you have the formula for a classic “popular front”-style coalition. Charles Barron sometimes talks left, but he has repeatedly voted for layoff budgets. Amid a big fight between NYC labor unions and Bloomberg, Barron voted for the 2004 budget which included 3,000 layoffs, including many school aides and paraprofessionals. Barron likewise voted for the 2010 budget which included 2,000 layoffs. And the year before, Barron vociferously campaigned for Democrat Obama, today commander in chief of U.S. imperialism and chief executive officer of American capitalism. Liberal Democrats and labor bureaucrats, joined by most education activists and union dissidents, pulled out all the stops to elect Barack Obama as a supposed peace candidate and friend of labor. While a few self-proclaimed socialist groups called to vote for this capitalist politician, slicker reformists (ISO, WWP) tried to cash in on Obama’s popularity by snuggling up as close as possible without formally endorsing him. In office, Obama escalated the war in Afghanistan, continued the occupation of Iraq and has now launched the bombing of Libya. Plus he enacted a health “reform” that puts billions more into the pockets of insurance companies and is leading the charge against teachers unions and public education (pushing charter schools, “merit pay,” closing schools, and wholesale firing of teachers). The March 24 coalition blanks out Obama’s role since its organizers were complicit in his election. Student and labor activists are excited and inspired by the recent outpouring of struggle in Wisconsin. Tens and hundreds of thousands mobilized day after day while the state capitol was occupied and workers vowed militant resistance to Governor Scott Walker’s vicious union-busting bill. Many chanted “general strike” as they stormed the capitol trying to “kill the bill.” But even though the local labor federation voted to endorse a general strike, this has been sabotaged and betrayed by the union bureaucrats. It is vital to learn the lessons of Wisconsin. Democratic state senators were hailed as heroes for skipping the state and stalling the vote on the bill to eliminate collective bargaining rights for public sector workers. Yet the Democrats (and the union bureaucrats) declared their support for all the cuts in wages, pensions and health care demanded by the Republican governor. Now the union tops are squelching strike action and instead focusing on a campaign to recall Republican legislators. If in Wisconsin, the onslaught was led by a far-right Republican governor, in New York the attack on labor has come from a liberal Democrat. Andrew Cuomo launched his run for governor saying “We’re going to be tangling with public employee unions” (Albany Times Union, 26 May 2010). The labor fakers were in a pickle, teachers unions did not endorse Cuomo. So instead they stumped for the “Working Families Party,” whose gubernatorial candidate was … Andrew Cuomo. Question: How can you fight layoffs, budget cuts and tuition hikes in a political bloc with Democratic politicians who vote for layoffs, campaign for presidents who bomb Libya and gut education, and who from the White House to the state house ally with Republicans to push through the latest round of layoffs, cuts and hikes? Answer: you can’t. Q: When Is a Democrat Not a Democrat? An article on the website of the International Socialist Organization (ISO) by Doug Singsen enthusiastically describes the March 24 NYC “state of emergency” against budget cuts, noting that several thousand marchers came out, including unionists from AFSCME DC 37 and TWU Local 100. It also highlighted other “key supporters,” in particular “the Freedom Party, formed by City Councilmember Charles Barron after he left the Democratic Party” (Socialist Worker, 30 March). One little problem: Charles Barron never left the Democratic Party. In our Revolution leaflet, we quoted Barron himself saying: “We are all registered Democrats.” If that’s not enough, go to Barron’s City Council web page, where it says right up top: “District 42 - Council Member - Democrat.” Or check out Barron’s vociferous support for the Democratic candidate in the 2008 presidential election, when he assured voters Barack Obama would put forward a “black agenda.” Like bombing an African country, Libya? Granted, Barron talks out of both sides of his mouth, occasionally posing as a “revolutionary” with students while toeing the line as a member of the Democratic caucus of the City Council, even to the point of voting for layoff budgets. Barron is appealing to the millions of black voters who know that the Democratic Party is a racist party. But he wants to provide the appearance of breaking with it, without actually doing so. And while criticizing racist politicians like NYC mayor Michael Bloomberg, it isn’t the capitalist system he’s attacking. Over a century ago, the German reformist Eduard Bernstein declared, “the movement means everything for me and that what is usually called ‘the final aim of socialism’ is nothing.” Sound familiar, ISO? At least he was talking about a socialist movement, his clones are talking about a “movement” with the capitalist Democrats. As Rosa Luxemburg replied to Bernstein: “The question of reform or revolution, of the final goal and the movement, is ... but the question of the petty-bourgeois or proletarian character of the labour movement” (Reform or Revolution). True then, true now.